Nern Plab Wan Village 3. 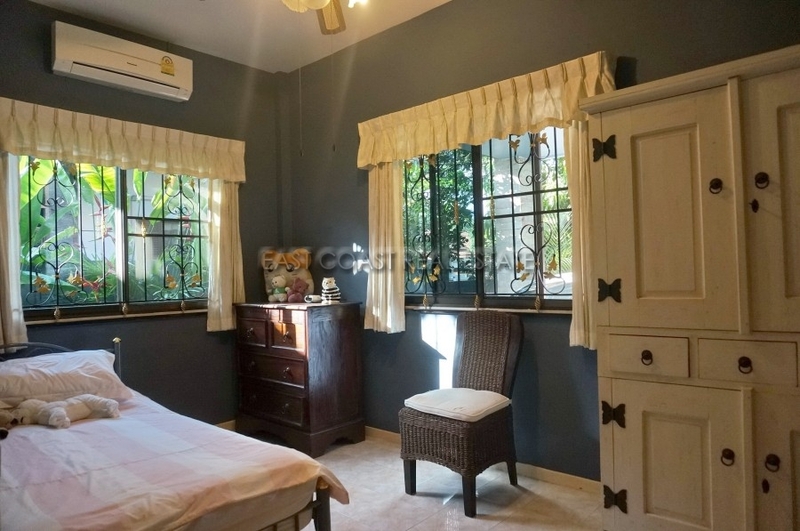 This quaint corner property is set in a secure village off the popular Soi Nern Plab Wan area of East Pattaya. It is neighboured on just 2 sides and as it is towards the end of the village it benefits from having less through traffic, and a larger than average plot, which has a lovely garden and shaded patio area. The house has 3 bedrooms and 2 bathrooms, a large open living room and an extended kitchen. There is also private off street parking. Soi Nern Plab Wan is a vibrant area, with markets and shops in abundance. It's also only minutes from Pattaya city. This village provides a nice communal swimming pool with plenty of entertaining space plus an on-site mini mart for convenience. The property is for sale un-furnished in THAI NAME, with the owner splitting tax & transfer 50/50.